In this paper, meta-heuristic optimization techniques are introduced and their applications to water resources engineering, particularly in hydrological science are introduced. In recent years, meta-heuristic optimization techniques have been introduced that can overcome the problems inherent in iterative simulations. These methods are able to find good solutions and require limited computation time and memory use without requiring complex derivatives. Simulation-based meta-heuristic methods such as Genetic algorithms (GAs) and Harmony Search (HS) have powerful searching abilities, which can occasionally overcome the several drawbacks of traditional mathematical methods. For example, HS algorithms can be conceptualized from a musical performance process and used to achieve better harmony; such optimization algorithms seek a near global optimum determined by the value of an objective function, providing a more robust determination of musical performance than can be achieved through typical aesthetic estimation. In this paper, meta-heuristic algorithms and their applications (focus on GAs and HS) in hydrological science are discussed by subject, including a review of existing literature in the field. 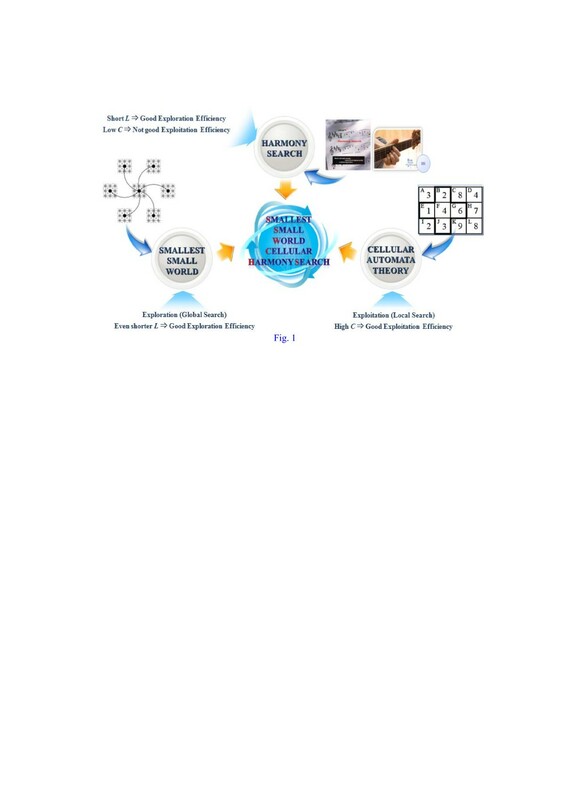 Then, recent trends in optimization are presented and a relatively new technique such as Smallest Small World Cellular Harmony Search (SSWCHS) is briefly introduced, with a summary of promising results obtained in previous studies. As a result, previous studies have demonstrated that meta-heuristic algorithms are effective tools for the development of hydrological models and the management of water resources. Optimization is the process of ensuring that an object or system is as useful or effective as possible; that is, optimization involves finding the best solutions to satisfy specific objectives and conditions. In conventional theoretical problems, traditional mathematical techniques such as linear programming (LP), non-linear programming (NLP), and dynamic programming (DP) can guarantee global optima in simple idealized models. However, in real world problems, factors such as non-linearity and complexity produce obstacles to obtaining global optima. Heuristic algorithms can be used to overcome such shortcomings of mathematical techniques and produce distinguished outcomes when applied to specific problems; however, they remain inapplicable in a broad range of situations. To address this, meta-heuristic optimization techniques based on iterative simulations have been introduced, allowing appropriate solutions to be found using limited computation time and memory and without requiring any complex derivatives. Many meta-heuristic algorithms that combine rules and randomness mimicking natural phenomena have been developed, including ant colony optimization (ACO), genetic algorithms (GAs), particle swarm optimization (PSO), simulated annealing (SA), and tabu search (TS). Such simulation-based meta-heuristic methods have powerful searching abilities, often allowing them to overcome the several drawbacks of traditional mathematical methods. For example, harmony search (HS) algorithms can be conceptualized based on musical performances (e.g., by a jazz trio or an orchestra) and used to improve harmony. Typically, musical performers aim for a near-optimal state (i.e., fantastic harmony) that is determined by aesthetic estimation; conversely, optimization algorithms seek a best state (i.e., a global optimum, represented by the minimum cost or maximum benefit or efficiency) that can be determined according to the values of objective functions. Aesthetic estimation is achieved by practicing the set of sounds achieved by a combination of instruments, whereas the value of the objective function is evaluated by investigating the set of the values produced by composed variables. Moreover, just as “better” aesthetic sounds can be achieved through practice, the minimization/maximization of the objective function can be achieved by repeated iterations [1, 2]. Here, meta-heuristic optimization techniques are introduced and their applications are discussed with reference to recent trends in water resources engineering, particularly in hydrological science. In Section 2, meta-heuristic algorithms and their applications to hydrological science are discussed by subject, including a review of existing literature in the field. In Section 3, HS algorithms and their application in hydrological science are described. Then, in Section 4, recent trends in optimization are presented and relatively new technique such as Smallest Small World Cellular Harmony Search (SSWCHS) is briefly introduced with a summary of promising results obtained in previous studies. Finally, Section 5 presents concluding remarks. A meta-heuristic is a higher level procedure that can be used to find a near global optimal solution to optimization problems that include incomplete or imperfect information or limited computation capacity. Meta-heuristics often make few assumptions about the optimization problem being solved, which makes them suitable for a wide variety of problems. Moreover, because they can search through large sets of feasible solutions, meta-heuristics can often find good solutions with less computational effort than traditional iterative methods or simple heuristics [3, 4]. In hydrological science, meta-heuristics such as ACO, GAs, PSO, SA, and TS are used in various sub-disciplines. GAs (which are search algorithms based on natural evolutionary mechanisms) are the most widely known meta-heuristic algorithms and were initially proposed by Holland ; they are also utilized more widely in hydrological science than any other algorithm. Figure 1 describes historical applications of GAs in various sub-disciplines of hydrological science. 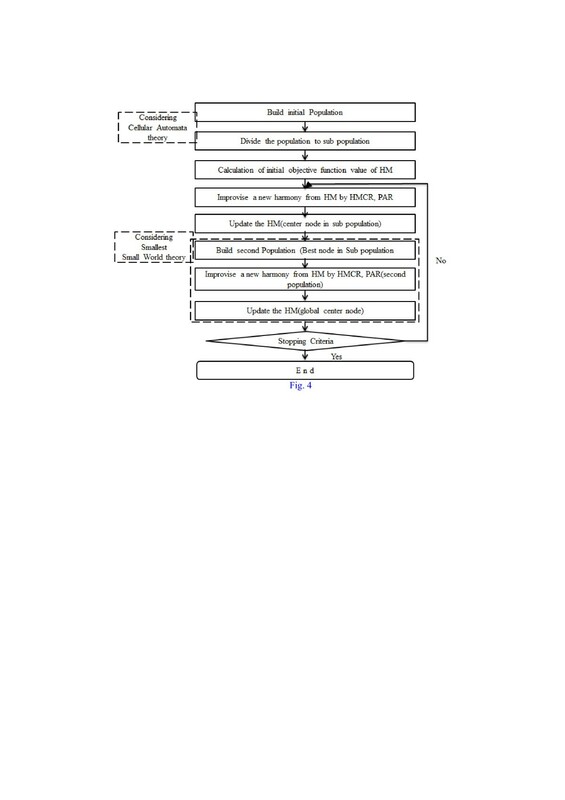 First, Savic and Walters  applied a GA to minimize the cost of a water distribution system, illustrating the potential of GAs as tools for planning of water distribution networks. Subsequently, Wang and Zheng  coupled a GA and SA to obtain the optimal pumping rate for a groundwater system, finding that their GA-based model was able to obtain almost identical solutions to other programming methods (or even offer improvements). 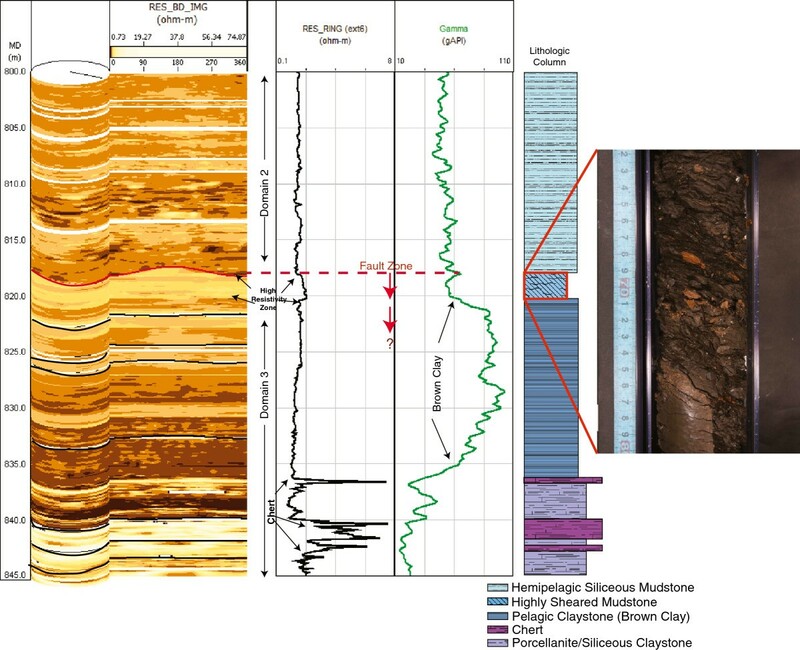 Similarly, Samuel and Jha  developed computer code to optimize various aquifer parameters under different hydrogeological conditions using the GA technique. GAs have also been applied in water resources management: Sharif and Wardlaw  developed an optimal multi-reservoir system using a GA; Wardlaw and Bhaktikul  investigated problems with water allocation in an irrigation system; and Chen et al. forecasted stream flow to help ensure more effective use of water resources. 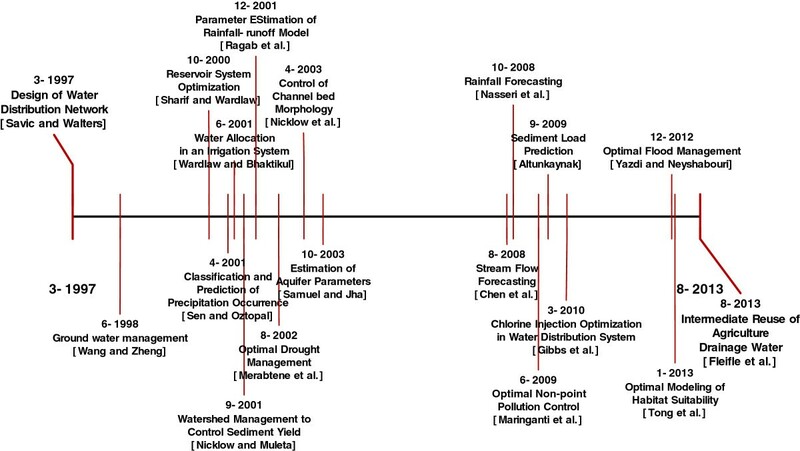 Recently, a methodology for determining the optimum reuse discharges of agriculture drainage water was proposed by Fleifle et al. . Water-related disasters such as drought  and flood  have also been solved using GAs; for example, Sen and Oztopal  adopted a GA to achieve the optimum classification of rainy and non-rainy day occurrences based on selected hydrological data. In the field of rainfall–runoff modeling, Nasseri et al. forecasted rainfall using a GA coupled with artificial neural networks, and Ragab et al. used a GA to conduct parameter estimation for rainfall–runoff models. Recently, optimal control of sediment has become a key issue in watershed management. Accordingly, some studies have investigated the use of GAs as an optimization tool [18–20]. At present, water quality issues (from the environmental perspective) are some of the most pressing optimization problems that can be solved by meta-heuristic algorithms. For instance, Maringanti et al. utilized a GA to investigate best management practices (BMPs) in a watershed and select optimal locations for nonpoint-source pollution control. Additionally, GAs have been used to solve a chlorine injection optimization problem in a water distribution system  and to predict the distribution of suitable habitats for selected species in deep water . Based on the various applications described above, it is clear that GA optimization techniques are effective tools for the development of hydrological models and management of water resources. Other meta-heuristic algorithms (including ACO, PSO, SA, and TA) have also been applied in hydrological sciences, although their applications are much more limited than those of GAs. Since the 2000s, the application of meta-heuristic algorithms has focused on a few key fields, particularly reservoir operation, groundwater management, and water distribution network design. Nevertheless, other meta-heuristic techniques have the potential to exhibit good performance in various hydrological sectors based on the positive results achieved for GAs. Historical application of genetic algorithms in hydrological science. As discussed above, HS algorithms can be used to achieve better harmony in the process of musical performance, unlike other meta-heuristic algorithms. Musical performances seek fantastic harmony, which is typically determined by aesthetic estimation, whereas optimization algorithms seek a global optimum that can be determined from the value of an objective function. HS algorithms preserve the history of past vectors and can vary the adaptation rate during computation. Moreover, as with GAs, HS algorithms manage several vectors simultaneously, although HS algorithms are different from GAs in many respects. HS algorithms offer two primary advantages: 1) they produce a new vector after considering all existing vectors, rather than considering only two parent vectors (as in GAs); and 2) they do not require the initial values of decision variables to be specified. Thus, it can be generally said HS algorithms offer more flexibility and better solutions than GAs. Since the HS algorithm was first developed in 2001, it has been applied to various engineering problems and has garnered increasing attention globally. According to Google Scholar, the study that introduced the concept of the HS algorithm has been cited over 1,200 times (prior to August 2013). In case of major literature, the number of citation is increased up to 541 times in Web of science (Science Citation Index Expanded (SCIE), Social Science Citation Index (SSCI), Arts & Humanities Citation Index (A&HCI)). Approximately 50% of the existing literature pertaining to HS algorithms relates to the fields of civil engineering and mathematics/algorithms (Figure 2); thus, it is clear that HS algorithms have been utilized in various ways, both applied (e.g., engineering) and theoretical. 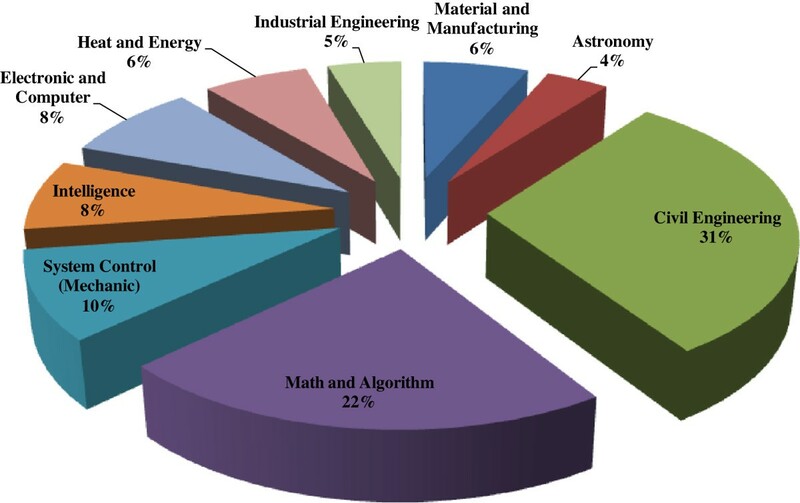 Applications of HS algorithms according to published literature. Applications of HS algorithms in hydrological science can be divided by discipline, as with other meta-heuristic algorithms, and the first hydrological applications of the HS technique were described in 2001. HS algorithms were applied to minimize the cost of a pipe network during the design process and to estimate parameters for the non-linear Muskingum routing model [1, 2]. Subsequently, Paik et al. developed a parameter calibration method for rainfall–runoff models and demonstrated how adopting powerful meta-heuristic optimization algorithms such as HS algorithms can enable researchers to focus on aspects of the rainfall–runoff model other than parameter calibration. Ayvaz  first introduced HS algorithms to aquifer modeling, using the technique to determine aquifer parameters and the zonal structure of these parameters based on a given set of observations of piezometric head. More recently, Kougias and Theodossiou  solved problems related to dam operation using HS techniques; in particular, they investigated the optimum operation of a four-reservoir system over one day, with the aim of maximizing the daily benefits obtained from the reservoir system. The studies cited here represent only a small portion of the existing literature in this field, yet their results demonstrate the potential for use of HS algorithms in solving complex optimization problems successfully and efficiently. The latest trends in meta-heuristic optimization in hydrological science can be classified into three primary categories as follows: 1) Hybrid algorithms involve combinations of existing algorithms and are designed to increase the possibility of solving complex problems by adopting the favorable properties of different optimization methods. 2) Recently, an automatic assignment technique has been developed for the setting of algorithm parameters. Existing meta-heuristic algorithms require decision-makers to set some parameters, and the efficiency of many processes can be affected considerably by parameter selection. Moreover, setting parameters often involves time-consuming tasks such as sensitivity analyses. However, in recent years, algorithms have been developed that do not require any parameters to be set; such algorithms can change parameters automatically based on factors such as the value of an objective function or the number of iterations. These algorithms have been shown to achieve similar results to those obtained using more traditional meta-heuristic algorithms and can be very useful tools for decision-makers. 3) A particularly interesting branch of optimization research focuses on the expansion from single-objective to multi-objective optimization. Multi-objective optimization seeks to obtain the Pareto-optimal sets between conflicting objectives, where Pareto-optimal sets comprise the sets of solutions that are better than all other solutions for at least one objective; these sets were referred to as non-dominated or Pareto-optimal solutions by Pareto . Multi-objective optimization is effective for use in real-world problems, particularly because most real practical problems involve many trade-offs between objectives. Here, a relatively new hybrid version of HS algorithm, the Smallest Small World Cellular Harmony Search (SSWCHS), is introduced. Lim et al. proposed an improved HS algorithm that uses the cellular automata theory and topological structure of the smallest small-world network (Figure 3). A cellular automaton is a discrete model utilized in many fields, including computation theory, mathematics, physics, complexity science, and theoretical biology. SSWCHS uses the concept of cellular automaton space arranged into regularly spaced grid cells, where individual cells are updated simultaneously in each discrete time step and each cell is a finite state machine. Each cell entered the state of its own and neighboring and, then, printout the state in the next time step. In the case of the smallest small-world network, it can be expressed by two parameters: the average path length (L), which measures the efficiency of communication or the time required to travel between nodes; and the clustering coefficient (C), which represents the degree of local order. The average path length (L) is defined as the average number of links in the shortest path between a pair of nodes in the network. Then, the clustering coefficient (C) can be defined as the probability that two nodes connected to a common node are also connected to each other. On this basis, short average path lengths and high clustering coefficients lead to good exploration efficiency and good exploitation effects, respectively (Figure 3). Therefore, a new hybrid HS algorithm (SSWCHS) can have high clustering coefficient (from smallest small-world) and short characteristic path length (from cellular automata theory). In addition, unlike most previous studies focusing on improvements to HS algorithms, SSWCHS modifies the memory structure itself. The flowchart of the SSWCHS is shown in Figure 4. Flowchart of SSWCHS model []. The developed algorithm has been applied in assessment of the optimal design of a pipe network designed to supply water to Hanoi (Figure 5), where it was used to determine the minimum cost of constructing sufficient pipelines to satisfy the water pressure requirements at all nodes. Although most of the algorithms investigated produced similar optimal values (Table 1), SSWCHS showed a superior performance than the other techniques in terms of the number of iterations required to reach the optimal value. The results prove that the developed algorithm displays better exploration and exploitation efficiencies. In this paper, meta-heuristic optimization techniques are introduced and recent trends in their application in water resources engineering particularly hydrological science are discussed. The information presented here can be summarized as follows: 1) In hydrological science, GAs is the most widely utilized meta-heuristic algorithm. 2) Several previous studies have shown that meta-heuristic techniques can be used as effective tools for the development of hydrological models and the management of water resources. 3) Some recent trends in optimization in hydrological science (e.g., hybrid algorithms, parameter-free techniques, multi-objective optimization) have the potential to provide efficient solutions to real-world problems. 4) Hybrid type algorithms, the SSWCHS algorithm for example, can produce very competitive solutions with less iteration than other algorithms. It is recommended that meta-heuristic algorithms be utilized as tools for pertinent studies in hydrological science. This work was supported by the National Research Foundation of Korean (NRF) grant funded by the Korean government (MSIP) (No. 2013R1A2A1A01013886). Dr. DGY carried out the survey of previous studies, participated in the sequence alignment and drafted the manuscript. Prof. JHK conceived the original idea of the study, and helped to write the final manuscript. Both authors read and approved the final manuscript.